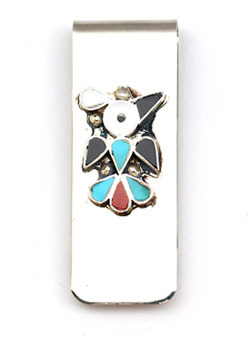 This nickle silver money clip has a sterling thunderbird that is inlaid with synthetic traditional multi colored stones that are set in sterling silver plain bezel. It measures approximately 2" long by 3/4" wide. Crafted by Zuni artisan Pino Yunie. Colors and placements will vary. You may not get what is pictured. Some do have the synthetic white mother of pearl also.